Soak up the unique culture of Argentina in its dynamic capital with an exciting Buenos Aires tour. One of the most diverse and cosmopolitan cities in South America, Buenos Aires, with its European feel, is often referred to as the “Paris of the Americas,” and for good reason. Its energetic inhabitants (called porteños), vibrant culture, exciting nightlife, high fashion, and diverse dining options make this city a lively yet classy place to visit. Explore the city’s various barrios (districts) and be sure to stop by a tango house to learn some of this city’s famous sensual dance moves. Tango originated in Buenos Aires, and it is not uncommon even today to see people dancing in the streets. Take some time to mingle with the locals of Buenos Aires on your Argentina vacation and you are sure to go home with unforgettable memories. You will be met at the airport by one of our Argentina For Less representatives and taken to your confirmed Buenos Aires hotel. Enjoy an exciting half-day Buenos Aires tour of the city’s highlights. You will start your tour in the city center, on the beautiful Plaza de Mayo surrounded by the Casa Rosada (Government House), the Metropolitan Cathedral, and the splendid Cabildo, which served as City Hall under the Spanish colonial rule. You will then continue on to Puerto Madero, Buenos Aires’ modern financial district, where you’ll learn about the fascinating transformation of this lively neighborhood. Your next stop is La Boca where the Bombanera soccer stadium and the large population of Italian descent showcase Argentina’s passion for soccer. In the San Telmo neighborhood, heart of tango, you will learn about the history of this beautiful, sensual dance that has become the symbol of Argentinean culture. Finally, you will visit Palermo and Recoleta, the city’s upscale neighborhoods where the Porteños (inhabitants of Buenos Aires) come to indulge in high class shopping and gourmet cuisine. 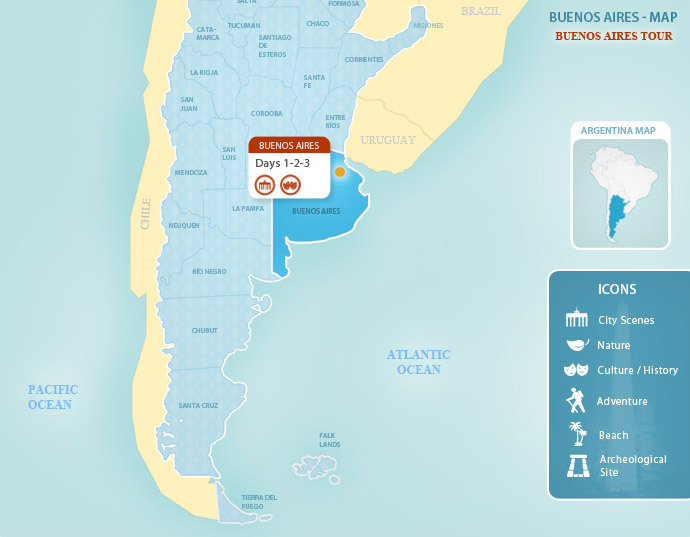 Enjoy a free day in Buenos Aires to explore the magic of this dynamic city at your leisure. Alternatively, browse our exciting additional Buenos Aires tours to enhance your time in the city. Today you will meet your transfer to the airport for your flight home or on to your next destination.